Namaskaar. Moving on to Verse #57 of Bhagavad Gita Chapter 2 and the commentary by Smt. Jaya Row on “Sthitaprajna — Person of Perfection“. In this verse he answers the question ‘How does he walk – kim vrajeta?’ meaning how does he contact the external world? When you read the last two verses you might think that a realised Person is inactive, insensitive, like a statue. What happens to a statue? Throughout the year its only visitors are birds who leave droppings behind. Once a year the civic authority gets into action on a special occasion and cleans the statue and puts a garland on it. But as far as the statue is concerned it is indifferent to both – the droppings as well as the garland. You might get the impression that a realised Person is like that. Namaskaar we continue to Bhagavad Gita Verse #56 of Chapter 2 where the Lord further describes a Person of Perfection. Smt Jaya Row has this wonderful commentary for us. Two significant words used here are, sthitadhi and muni. Sthitadhi is ‘one of ‘steady intellect’. Muni means a contemplator, visionary, thinker. A combination of these two is essential for all development, material or spiritual. Namaskaar. Today we begin a new series of posts, in several parts, on a very useful topic “Sthitaprajna — Person of Perfection“. This is explained beautifully by Lord Krishna in Chapter II Verses 55-72 in response to a query by Arjuna in Verse #54. The Lord defines a Perfect Person, what makes one so, how one acts and transacts with the world, how one is guided by one’s Intellect, not swayed by one’s Mind, how one controls and regulates one’s own thinking and consequently . Its the most beautiful piece of literature pleasant to hear, enjoyable to read and learn. Namaskaar. 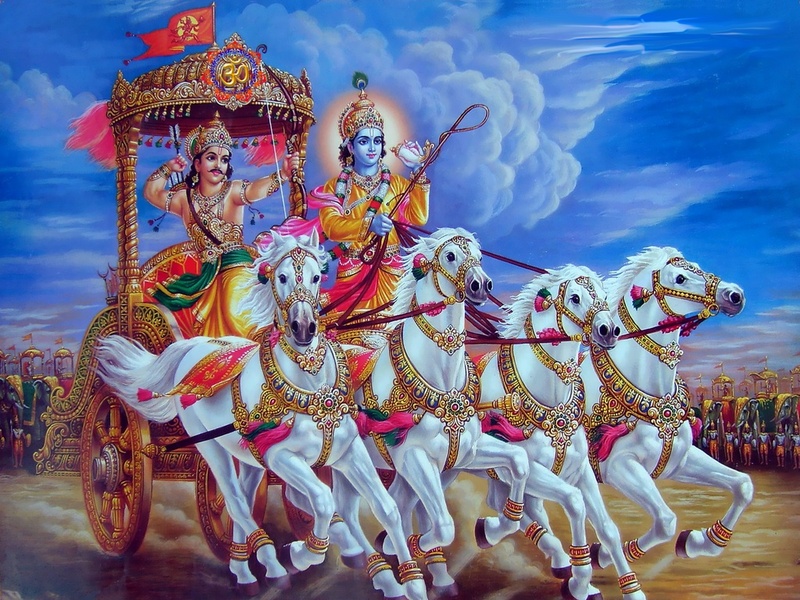 Moving on to Part 10 of our ongoing series Introduction to Bhagavad Gita. Pujya Swamiji now explains in detail the Guru Shishya Paramparaa and how and why one should necessarily study the scriptures under a Guru, Teacher. So enjoyable and enlightening to read and learn in this way. The sense of the gita-sasatra, which is in the form of the essence of the meanings of all the words of the Vedas, is difficult to grasp. Namaskaar. Continuing with the wonderful Introduction to Bhagavad Gita by Pujya Swamiji in this our Part 9. This is a brilliant explanation of the Gita, why its considered a Pramana Grantha, its place in the Vedic teachings, its compliance with vedic laws and principles, its usefulness to us, its purpose and the beauty and validity of its teachings for each one of us. Not only are we all fortunate to have the great Gita as our guide but also Pujya Swamiji to explain to us the utility and beauty of this great treatise.